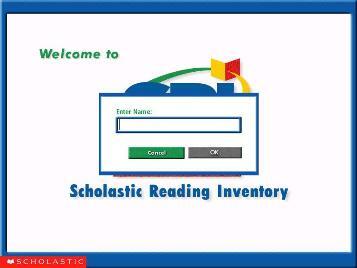 Within the first few weeks of school every student takes the Scholastic Reading Inventory (SRI) test on a computer. It is an untimed test that varies in number of questions and difficulty. Students read paragraphs from actual books (not text made up by test writers) and then answer one question about each paragraph. If the student answers correctly, the next question is just a little bit more difficult. If the student answers incorrectly, the next question is just a little bit easier. The test continues in this way until a Lexile level is established. The Lexile level is the measure of reading difficulty given to text, based in part on sentence difficulty and length and word frequency (how often the word is used in the English language). For more information about the Lexile framework, visit http://www.lexile.com. The scores at our school ranged from BR (Beginning Reader) to over 1700. Based on the results of the SRI test, each student is given a minimum Lexile level to use when selecting RC books. The Lexile level assigned to each student is NOT the raw score received on the Scholastic Reading Inventory test. The recreational level assigned to each student is considerably below the instructional level earned on the test. The Lexile level has nothing whatsoever to do with the length of a book. The Lexile level has nothing whatsoever to do with the theme or content of a book. The books with no Lexile rating appear on everyone’s list. In addition to a minimum Lexile score, each book has a point value. The point value is based on the Lexile level and word count. Students have been told that they may request that books below their Lexile be added to their list. The librarian and/or classroom teacher has the right of refusal. The students are asked to make the request before the book is read to avoid disappointment. HOWEVER, ANY BOOK CAN BE READ BY ANY STUDENT with the understanding that Reading Counts credit may not be given for every book.